I haven't posted on my blog for a couple of weeks now as I've had abit of a flare up of my illness. Hopefully, I'm now coming to the end of it and should catch up. 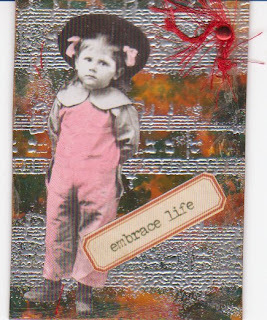 I made a new ATC for swapping in the Trimcraft forum. It's called 'Embrace life'. I used alcohol inks on the background, then stamped and embossed in silver and added a picture of a little girl. It brings my grand total of ATCs now to 7. I've ordered a cuttlebug from my local craft shop, so expect to see lots of embossed cards in the next few weeks as I get used to it.